As we begin to prep ourselves for the upcoming holidays, I wanted to encourage each of you to think about how you can make the most of your local foods for your meals with family and friends. 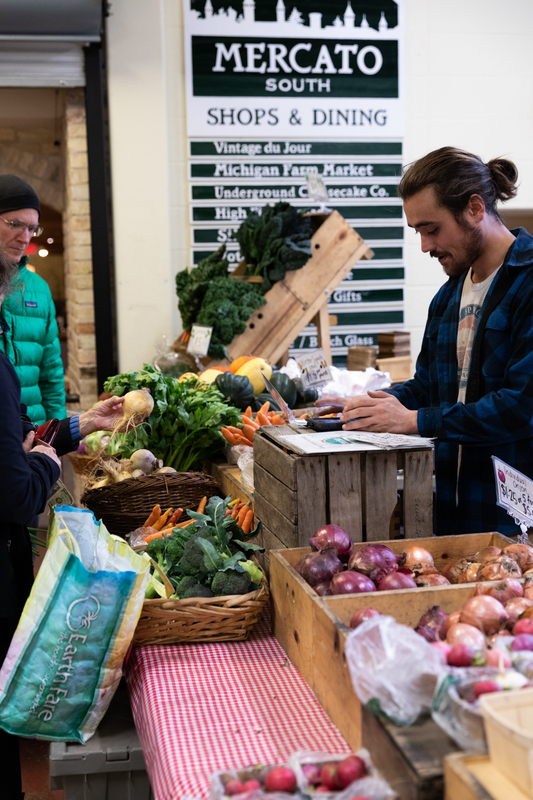 So I partnered with the Michigan Farmers Market Association to share some of the ways I make the most of the cold weather veggies that can fill our tables this time of year for the holiday season. 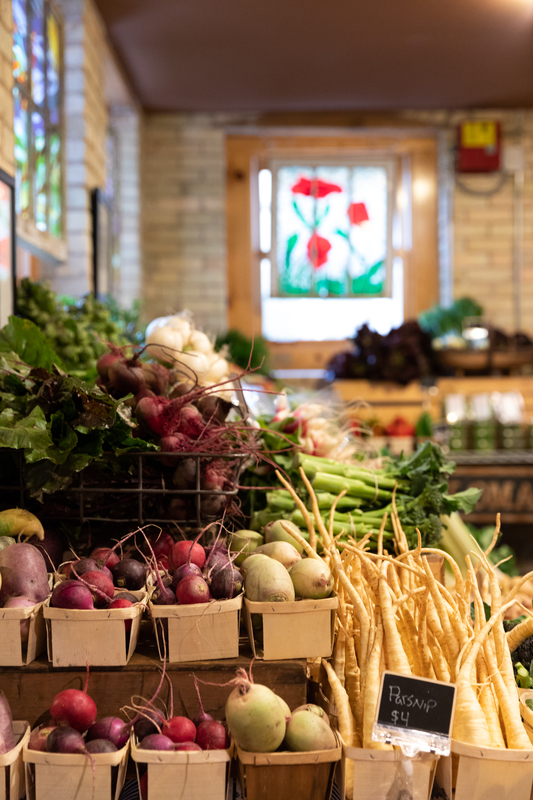 This time of year we see a lot of onions, garlic, hearty greens, celery, beets, fall radishes, and even some of those tender items we saw in early Spring. These things will serve us well as we head into the holiday season. We can purchase them and plan ahead to do it all and make the most out of what the markets have to feed those we love. 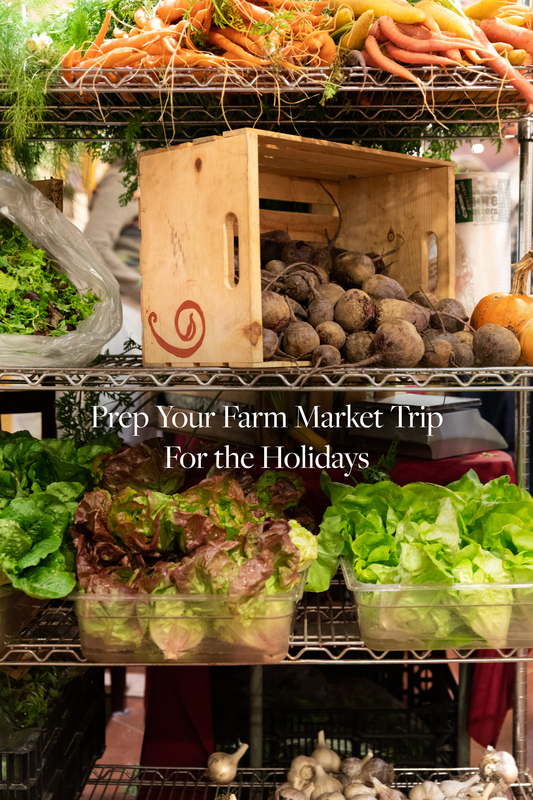 So here are 5 ways to use your farmers market trip wisely for the upcoming holiday season. 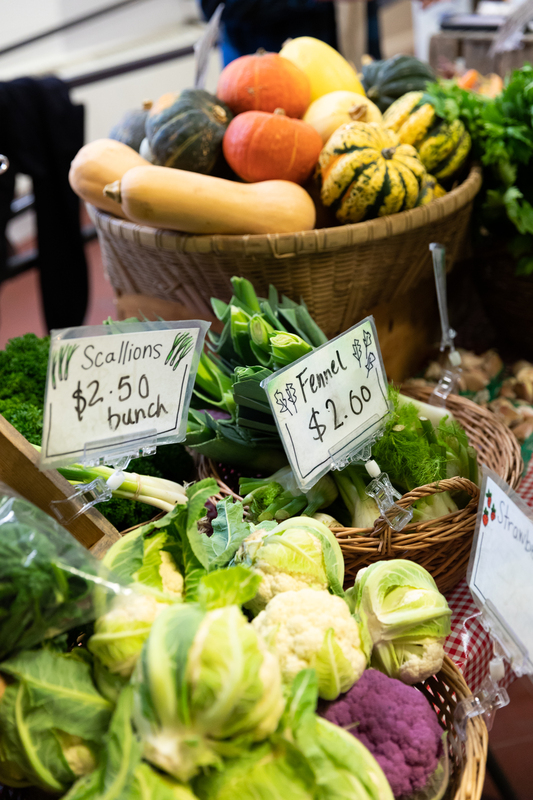 Shop ahead of time: My Farmers Market is on Saturdays here in Traverse City at the Village of the Grand Traverse Commons. That is a good 4-5 days ahead of holiday so I will plan ahead to get everything. It sounds tedious to do, but I find that this is one of the best markets of the year. Everyone is in the spirit and prepping for the meal ahead. It is exciting to join in and see the special things the farmers and makers have for their customers for the holiday. They usually have great recipes just for that season as well. Prep things when they are home: Right when you return from the market, store everything to ensure they last for a few days. Make sure your carrots are cleaned and the greens are separate from them. Save it all though because those carrot tops and celery tops can be saved for stock or to replace herbs you may not find in sea- son where you are. They hold a ton of flavor so place in a container so they stay crisp and ready for a use on the day of. Store your potatoes and onions where they will stay cool and dry so they don’t get mushy too quickly. Take a few things and prep them for quick pickles for appetizers or quick ways to spice up dishes like leftover turkey tacos or things like that. Keep your veggies and animal products separate: With the upcoming thawing of a turkey and other meat and animal products that may be more abundant in your fridge, don’t take risks. Keep fresh veggies separate from meat or where meat could potentially drip onto fresh veggies as they thaw. It would be very sad to find the turkey let loose on your salad greens and you couldn’t use them. Pre-roast veggies: If you plan to make a salad with roasted root veggies or so on, do some pre-dinner prep by roasting the veggies before hand. Take any skins or scraps from roasting and make broth to have to make a gravy or add to stuffing on the day of. It is a simple way to have quick things on hand for lunches and dinners with guests but also have something prepped for the big day. Prep and Freeze: Honestly I have been prepping for our family Thanksgiving Dinner since September. I have been slowly putting away veggies and applesauce that we can use for the week we are hosting everyone. This way I am able to ensure ease of hosting so many but also be able to focus on guests when they arrive because things are pretty simple. There is little that needs to be made ahead of time. I roast a chicken a week ahead of time for broth and anything else we may need. I make my own butter from heavy cream from a local dairy farmer and freeze it for the day as well as save the leftover buttermilk so we can make pancakes or anything else we may want to with it. This eliminates a rush out to buy things before hand. You don’t have to do the stressful holiday shopping you are most likely dreading. I know I need a handful of items that I cannot find locally so we will grab those weeks in advance before things get hectic. Then the week of Thanksgiving if we go to the store it is only to get Bananas or simple things that most likely aren’t in demand. So tell me how do you prep for the holidays with goods you are finding at the farmers market? How do you make sure you are keeping the food safe so it good for your guests or yourself? 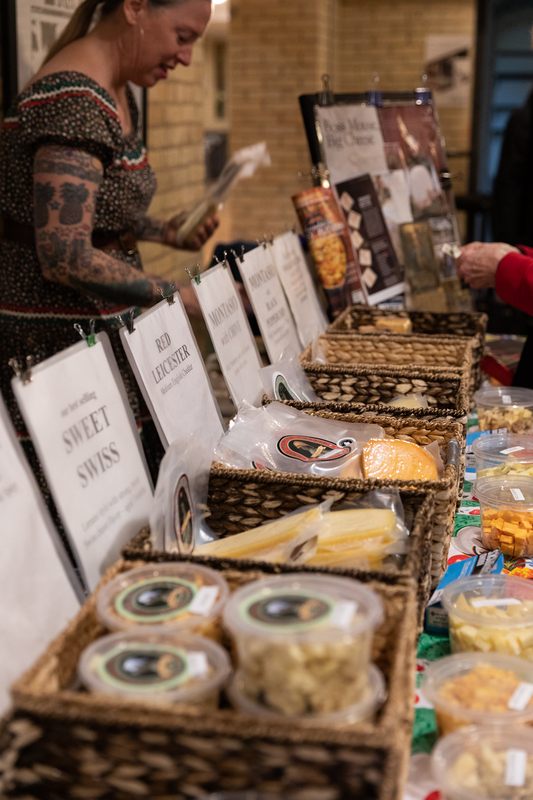 This post was sponsored by the Michigan Farmers Market Association. Thank you for support- ing the brands and businesses that support The Fresh Exchange every year.